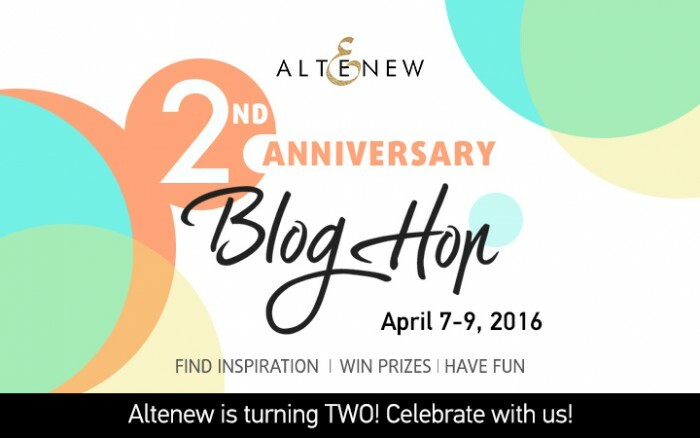 Hello friends and thank you for joining us for the Altenew 2nd Anniversary Blog Hop (more below). I have a very simple and elegant card created using supplies mostly from Altenew, I incorporated a few of my favorite products plus a favorite technique. A dear friend of our family lost her mother recently and I needed to make a sympathy card. I’ll be honest with you, those are always very difficult to make and even more difficult to give. I tried to make this project as simple as possible and used a few of my favorites. I tried to make this card so that it would be very light and full hope and comfort. I used one of the flowers from the Botanical Garden stamp set and stamped it using Hero Arts Intense Black ink, which is a waterproof one among other things. The flower was colored using Kuretake Gansai Tambi Watercolors, I used 3 colors only here. Instead of going with traditional green for the stem and leaves I ventured into red and used yellows for the petals. 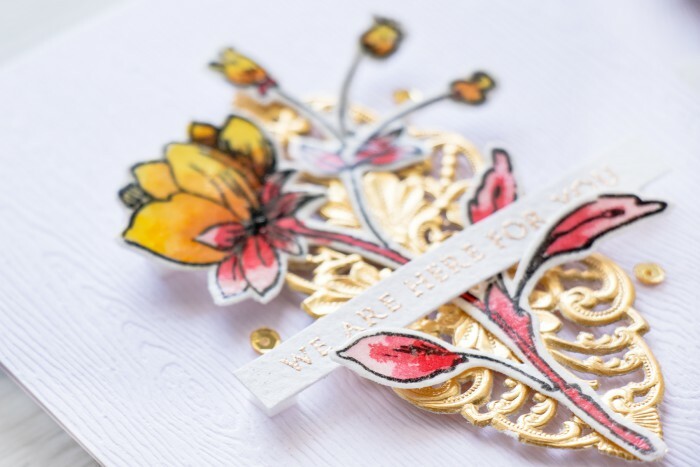 The flower image was fussy cut (although there are matching dies) and coated with one layer of clear embossing powder. This added a lot of glossy shine and also made the watercolors appear more vibrant and saturated. I adhered the flower onto one of the Altenew vintage trims using Multi Matte Medium adhesive and foam mounted that onto an A2 top folding card base created out of woodgrain cardstock. 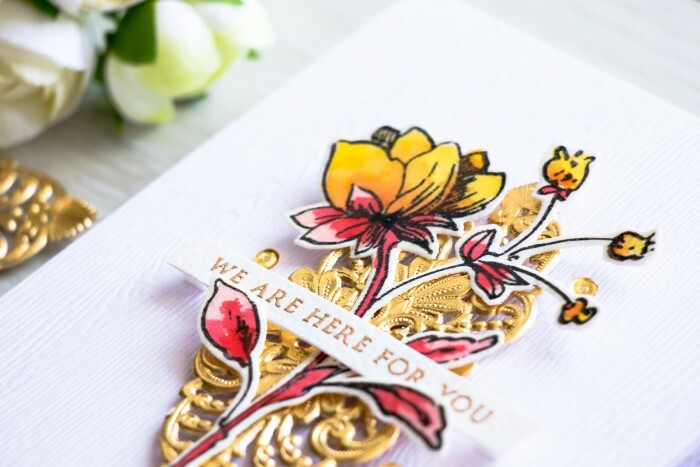 Sentiment, we are here for you, came from the Thinking of You stamp set and was heat embossed in Brass Embossing powder onto watercolor cardstock to match the color and texture of the card to the one used for the flower. The card was also embellished using a few mini gold sequins from Pretty Pink Posh. Hop along with us to find loads of creative inspiration from Altenew designers and guests! If you arrived from WOW! Embossing Powder the next stop on the hop is my very talented friend Taheerah Atchia. Leave comments along the way for the opportunity to win one of THREE prize packs valued at over $100 from Altenew! There are also 8 awesome companies who are celebrating with Altenew, and they are offering additional prizes (read more about that on Altenew Blog). Enjoyed your spin on this card. It truly gives the feeling of hope and comfort. Yana this is a gorgeous card. Thank you! Wow I haven’t visited your Blog before but will be again love your work. 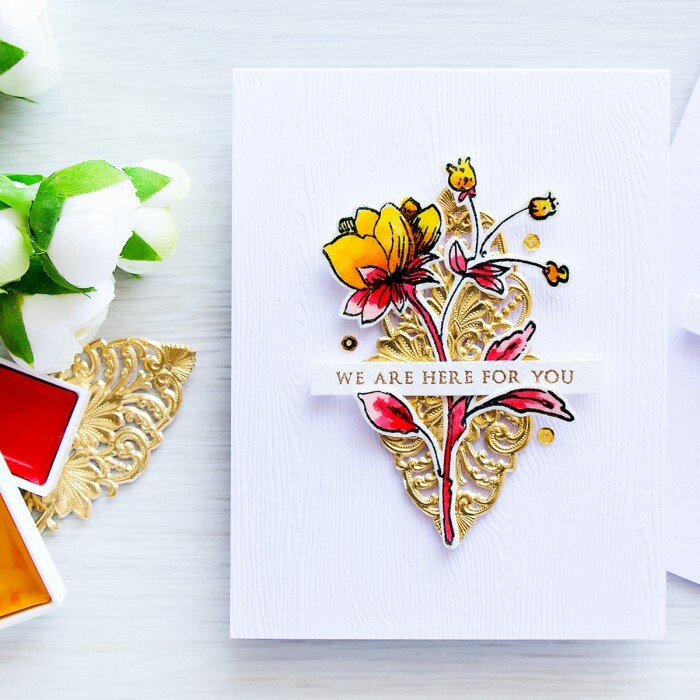 Love the way you have layered up your Gorgeous Card and your colours are Beautiful! 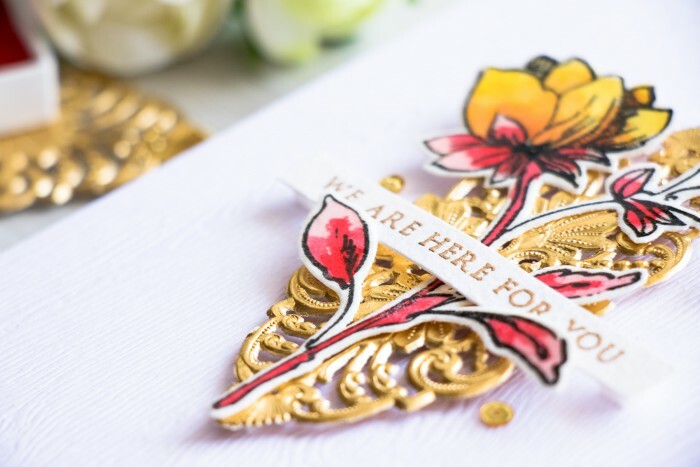 Beautiful Sympathy card Yana…. so elegant and full of hope…. So beautiful and elegant cards! Thanks for video tutorial! Absolutely gorgeous. I love the gold embellishment that brings it all together. What a lovely, elegant card. Thanks for sharing. Very elegant card. I love. Yana, this is stunning! Your designs is simply amazing. Gorgeous card! I have one of those embossing daubers & have been wondering how I could use it – thanks for the idea of embossing over watercolored images! Holy WOW! Just gorgeous! I am in love with Altenew!! Thanks for the inspirations!!! Embossing and watercolor really make a nice statement. Thanks for sharing that idea. Lovely card. How stunning! I like how you bucked the trend of green stems! I’m going to try that too! WOW! Love this! Clean and simple, but elegant and layered as well! Gorgeous! I remember seeing this card on my Instagram feed and was blown away at how simply gorgeous it is! LOVE! 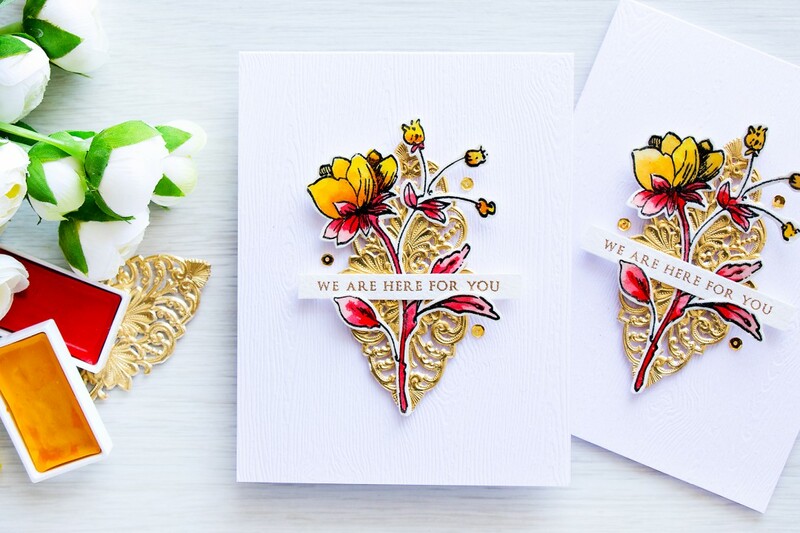 What a beautiful card and I love how you used the clear embossing powder to make it more vibrant. I am so sorry for your friend:( Your card is beautiful and I am sure will give comfort! Love the technique, thank you for sharing!! Oh I love the goooooold :)))) this is a very swee and bright greeting.